This past weekend we held a celebration of teaching, honoring the entire MƒA community – comprised of over 1,000 New York City public school mathematics and science teachers – at our 12th Annual MƒA Fall ƒunction. 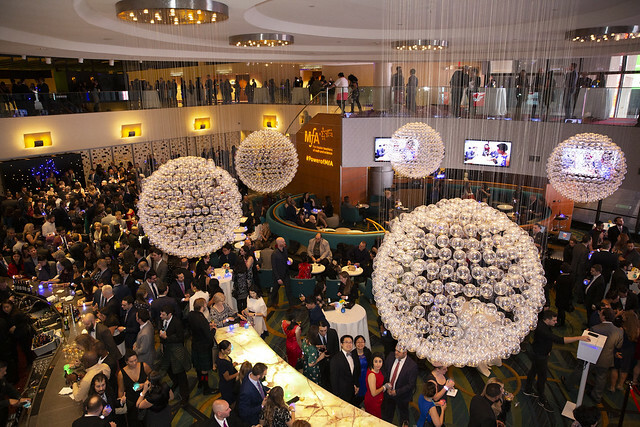 MƒA teachers and their guests, as well as other leaders in STEM education, gathered on November 10 at the New York Marriott Marquis in Times Square for the evening gala. The Fall ƒunction is our signature event, and this year we recognized the #PowerofMfA, illuminating the connections and profound impact that MƒA teachers have on their schools, their communities, and the teaching profession at large. The event featured a cocktail reception, dinner, and program filled with energy and displays of “power,” from futuristic light tunnels and waves of light to electrifying speakers and more. The keynote address was delivered by NASA Astronaut Kathleen “Kate” Rubins, who was introduced by Jim Simons, MƒA Founder. Rubins spoke about NASA’s recognition of the power of teachers on their students’ lives, and how each astronaut has fond “teacher stories” of the educators who have made an impression on them to this day. Rubins shared video highlights from her 115 days in space and two spacewalks, providing the MƒA community with inspiring stories and ideas to share with their students. The featured teacher speech was delivered by Lynn Shonn and José Vilson, MƒA Master Teachers, who were both introduced by Megan Roberts, MƒA Executive Director. Shon and Vilson called on the MƒA community to work together to transforms schools and classrooms into vital spaces for social, environmental, and political change. John Ewing, MƒA President, was the evenings’ emcee. He emphasized the importance of all MƒA teachers in our community, sharing that one can be a mathematician or scientist in many ways. Being a teacher is one of them. Scroll through photos of the gala below. You can also view photos from the 8th floor Photo Booth 1 and Photo Booth 2 and from the 9th floor Photo Booth.